A gift for coffee enthusiasts that they will love. With this coffee gift subscription, just choose the coffee, size, grind and frequency then leave the rest to us. 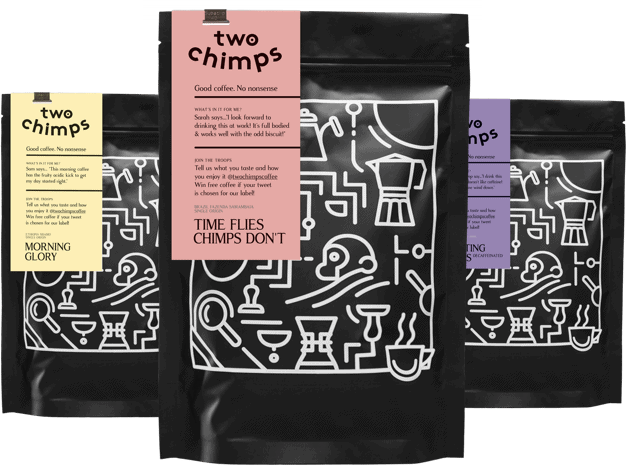 The first delivery is complete with a Two Chimps Coffee Tin and Magnet Set, a welcome letter and the first bag of freshly roasted coffee. All orders after this are sent with free 1st class delivery via royal mail. 250g bags will fit through a standard letterbox and 500g bags will be in a small parcel. We hand roast our coffee in small batches to ensure that every bag is as fresh as possible. Our ethically sourced, specialty coffees are full of flavour and bursting with character. At any one time, we have 6 specialty single origin coffees, all different and all lovingly roasted. Our single origin coffees are sourced from smaller farms and with this in mind, there is only so much coffee grown in each harvest. This means when it’s gone, it’s gone. Never fear though, we replace the coffees with something similar in taste and just as yummy. If the replacement is not quite to the same liking, just’ hola’ at us and we’ll swap it. If you’d like your coffee lover to try lots of different coffees, then choose our Mystery Coffee Gift Subscription. This will include a randomly selected bag of coffee, which can also include our limited edition blend that changes frequently. Ready to roll? Get started by choosing your coffee lovers roast style, desired drinking time, grind, bag size and frequency and we will do the rest. Or as we mentioned, just click mystery rather than a roast style. If you’d like to order now but delay the delivery, just pop a note at the checkout and we will hold off on posting your order. Go on, let’s tick this present off your list – your coffee lover will be chuffed to bits.